Keyara is officially an Ecklund! We stood in shock today as we heard the words “Your I-130 petition is approved”. 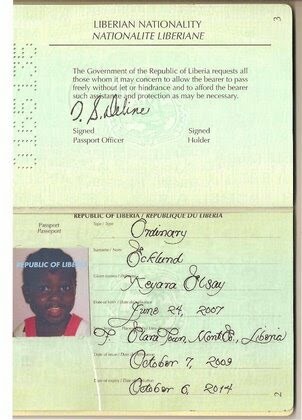 Keyara has been officially recognized by the U.S. Government as an immediate family member . . . Keyara Elsay Ecklund. On Tuesday, October 20 at 0930 we have an interview at the U.S. Embassy as part of our application for Keyara’s Immigrant Visa. We have been told that within a week or two from that interview we can expect to have an Immigrant Visa in Keyara’s passport. This makes Christmas in California seem like a real possibility! We’re now letting ourselves dream about getting on an airplane and heading home . . . but that will be a costly adventure. It will be about $10,000 for our family of 5 to return home and that’s money that we don’t currently have. As our time in Liberia continues to drag on our monthly support continues to decrease. We know that economic times are hard right now and are grateful for those that have been able to continue in their support. However, Mercy Ships will no longer process our funding after December 31st, 2009 so we wanted to make people aware of our needs now before it is too late to donate. As our time in Liberia draws to a close we have mixed emotions. We are very excited about returning home to California to be with family and friends – but we’re sad to leave the life and people we have grown to love here in Liberia. We will always carry Africa in our hearts and we’re especially glad that we can take a part of Liberia home with us in the form of Keyara!! Thank you for your thoughts and prayers and we will keep you posted as we know more! Thats great news 'guys'. Glad to hear it! 14.Oct.2009 - Keyara is coming home! Praise be to our Father and the Lord Jesus Christ! With thanksgiving we fondly remember that joyful day you first brought Keyara to meet your Africa Mercy family. We are SO thrilled and happy for you, although understand the very mixed emotions. We will look forward to updates. Love from us all. Hey there neighbors congrats to you that this has finally gone through. You have fought the long fight and have won! Praise be to God for His perfect Will! Thanks for being faithful in serving the people of Liberia so long while you waited! For that God is truly pleased! We love you and hope to see you all in California after Christmas! 14.Oct.2009 - So excited for you! Wonderful news! I'm still crying...a good cry...over the joyous news and the breakthrough. So excited to hear of your blessed news! You are in my continued prayers. 14.Oct.2009 - Glad for you. I'm so happy for you and Keyara. Hope you are all doing well. What wonderful news, so happy for you all. Dear friends,this is exiting news, something you have been waiting on for so long finaly happend. You have done great, and we hope you can join your family soon. Praise be to God, who has everything under control. We are very happy for you all. Blessings from the Eveleens Family. Oh, Praise the Lord!! WE are so happy for you, and looking forward to the day that you can visit your "family" in TX again! Praise God! We're so glad for you. This has been such an adventure for you. We pray for you often and hope you are home soon. 19.Oct.2009 - Patience is good! Congratulations, you endured and persevered,God has honored your faith and long suffering because you loved a little one. He will provide for this need to go home, as you know already He is always with you and faithful. We will be praying toward this particular need. He will finish the work He has started.